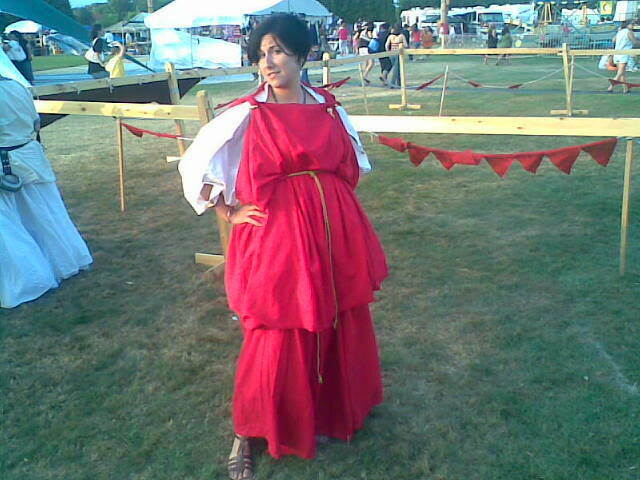 One of the first pieces of Roman clothing I made was the stola, or, overdress of a matron. I was married at the time and it seemed like a good idea. I wish I could find pictures of the construction of it, because as far as a “tube dress” goes, it was a pain, being that i made it to almost-period specs, and it’s about twice my height clocking in at 8 full yards of this sassy red linen, and I still didn’t get the neckline right. I’m planning to make another one, um, eventually. With a proper institia, more on that as it comes and I can do more research on what it should look like exactly. Here’s my first Roman garb EVUR. (I think this was 2008?) That white chiton still hasn’t softened. And here it is as a stand-alone garment, which is how I wear it more often, however in that case, it is NOT a stola, just a form of a peplos without the peplum. I do plan on fixing the neckline eventually, because this is such lovely red linen, I’d hate for it to go to waste, especially at a whopping 8 yards in one dress. At least it fits better now that I’ve, uh…filled out. Complete with adorable and totally period Northern Army trim girdle. Next ›Welcome to the new blog!